Kranjska Gora is Slovenia's best-known ski resort. But despite the good snow and the breathtaking surroundings of the Julian Alps and the Triglav National Park, it's still not that well known. The Alps and the National Park make this an excellent summertime destination for folks looking for a bit of an adventure, but most of the best places to stay in Kranjska Gora are perfect for any season. There are plenty of different types of accommodation on offer in Kranjska Gora, from hotels and apartments to 'tourist farms', basically a farm stay. Summer visitors and those on a tight budget may decide the best option is a campsite, while winter visitors will appreciate the Alpine hostels and chalets. Slovenia isn't the trendiest of ski destinations, but the Julian Alps certainly provide the slopes, snow and backdrop skiers need. So Kranjska Gora is definitely worth a look if you're after a reasonably priced holiday. Although it has become better known since they began holding ski jump and Alpine skiing competitions here. The skiing is best suited to intermediates as they have the largest choice of runs - 30kms worth. But, there's something for beginners and experienced skiers as well. Spend two days sleeping out under the stars while you scale Mount Triglav, explore some of the underground cave networks, or board your raft to attempt the ride down the national park's dramatic gorges. There's a bike park for mountain bikers to play in, but there are also plenty of walking and biking trails. The Triglav National Park is also ripe for mountaineering adventures and the Soca Valley is world famous for the rafting courses it offers. Spend an afternoon at Lake Jasna (2km out of town), set amongst stunning natural scenery. Hike in the surrounding area, go for a swim in the water or simply enjoy a relaxing picnic. Visit the Russian Chapel, originally built by Russian prisoners of war and which now commemorates the lives lost in war. A peaceful and moving spot. If you're fond of the great outdoors then you'll love Zelenci Nature Reserve, full of thermal springs and with a turquoise-coloured lake! The 300-year old Liznjekova House is a fascinating little folk museum. The ideal place to learn all about the area's history and culture. If you're exploring the Triglav National Park with your family, one of the best places to stay in Kranjska Gora is the Suite Hotel Klass. The accommodation is in small apartments and suites which sleep up to six. All have their own kitchens, though the hotel also does a generous breakfast buffet. The reasonable price means this is also ideal if you're here to try a spot of skiing. 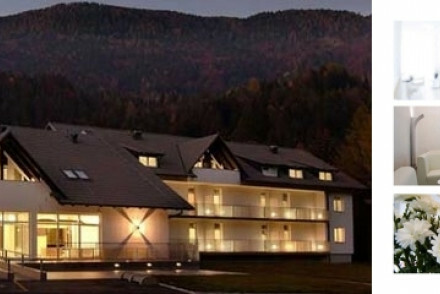 And if you're looking for somewhere to stay where you're surrounded by the beautiful views of the Triglav National Park then this is definitely one to book. The ski season starts in mid-December and runs until March, with the highest snowfall in January and February. If you want to hike then visit in the summer -the average temperature climbs to 19°C in July. This is the best time to truly make the most out of the area's natural beauty. International visitors can fly into Ljubljana Airport, located just under two hours away and served by direct flights from London Gatwick with Easyjet. From here, there are regular buses to the centre of town and from there on to Kranjska Gora. Browse through our list of all the best places to stay in Kranjska Gora. Suite Hotel perfect for families or groups of up to six. All rooms have a small kitchen, balcony and plenty of storage for ski gear.